During the months of October, November and December 2012, MAPS came to the town of Ripoll. 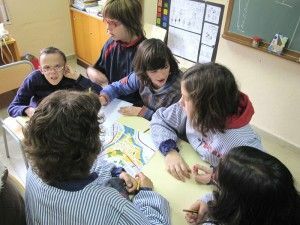 Working jointly with 13 5th year pupils of from the Escola Tomàs Raguer and 8 pupils from the Escola d’Educació Especial Ramon Surinyach, 21 pupils in all, although it is intended to repeat the activity with other pupils from the two schools. • in working collectively, interacting with the environment. • in finding a role within the group. - in learning how to switch the role with colleagues along the way. • in learning to understand the immediate environment offered by the two-dimensional plane, recognising the individual's position in space. • in learning how to handle a camera. • in bringing contemporary art in the classroom and use art in a cross-disciplinary fashion: photography, drawing and painting, as means of expression. FIRST SESSION: At school Ramon Surinyach. Welcome and presentation of the activity, creation of working groups for the sessions. 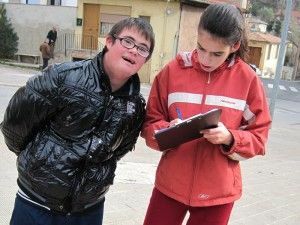 The route around Ripoll was defined by choosing areas of the city for exploring and photography; participants started to practice with cameras in the school. SECOND SESSION: On the second day, the tour of the historic centre of Ripoll began. Each group had a map with the route marked, and a camera. On reaching a point of interest, participants established roles among themselves, alternating as needed. - 2 Guides: bringing maps and guides to the group with the help of an instructor. - 2 Photographers: bringing cameras and drawing pictures when arriving at a point of interest. - 1 Secretary: taking notes about the experience, as well as about curiosities seen along the way. On a giant Ripoll map a selection of photos taken during the trip was pasted in the right place. On a second, more expressive and personal map, each participant drew their favourite spaces and curiosities in collage, pens and wax crayons. The activity ended with the exhibition of the maps at the school.